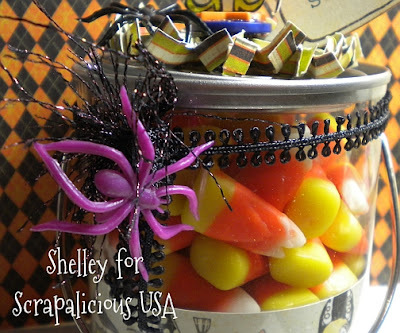 Now through October 25th using Promo Code "Discount10%" You can get an extra 10% off at Scrapalicious USA! Hello...it must be Wednesday because here I am again to show off what I made for my weekly project with the Scrapalicious USA Design Team. The theme this week is all about "Something Clear". My brain rattled around in my head for awhile on that one and then I had one of those "aha" moments when I remembered I bought some clear plastic pails last Christmas at Craft Warehouse. Yay! I added some fiber and ribbon I had on hand and those ridiculous spider rings. They finally have a better use than being laid on the carpet to freak me out on my blurry-eyed way to the bathroom in the morning! One of the spiders I pearlized a bit with some Liquid Pearls. 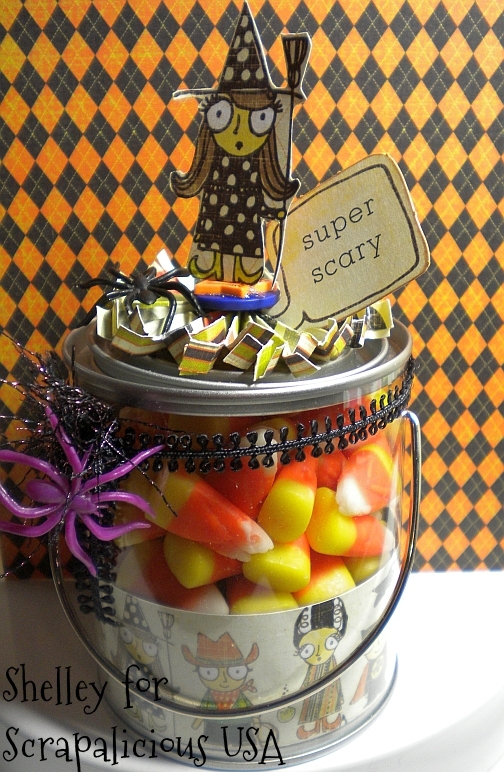 The paper is my favorite Halloween paper this year...it's the Blackbird Collection from My Minds Eye. I gotta say, I think this paper is a-d-o-r-a-b-l-e! 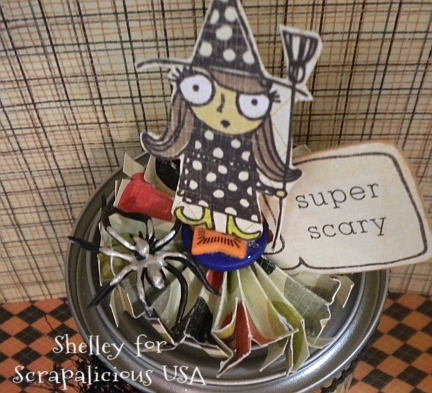 I created one of those accordian fold paper rosettes to the lid of the pail and fringed the edge of it to make it look more scary...kind of like spider legs! Let's talk a minute about the Scrapalicious USA store. All the prices are already reduced 25% from retail. All the time! This paper pack Collection I used retails for $8.99. Your price is only $6.75! The liquid pearls retail for $2.49 and they are yours for $1.89! Please go and visit the store. You will NOT be disappointed! 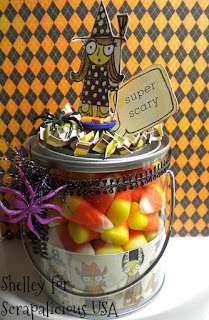 We put candy corn and some pumpkins in a clear jar too. Unfortunately every time I walk by it I think ooo that looks good. - It's now half way gone! lol Looks cute!